Uninhibited, impulsive, and a little defiant - maybe not your average wine description, but hey, this isn't exactly your average wine. 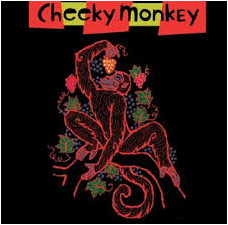 Cheeky Monkey offers traditional yet untamed, flavourful wines meant to be enjoyed in their natural habitat - free from pretension and over-analysis. Embrace the unconventional and get cheeky. Chardonnay, Australia - apple, pineapple,tropical fruits & no wood. Gewurztraminer, Germany - floral, spicy aromas with peach & apricot flavours. Pinot Gris, Washington State - pear, white peach & pineapple with a refreshing finish. Riesling, California - floral nose with crisp citrus, honey & apricot flavours. Sauvignon Blanc, South Africa - crisp green apple with pineapple, pear & herbal notes. Cabernet Merlot Garnacha, Spain - blackberries, cherries, silky tannins & a soft zesty kick. Cabernet Sauvignon, South Africa - blueberry, strawberry, black cherry & soft leather accents. Malbec, Chile - cherries, chocolate, mint & a smooth finish. Merlot, Chile - rich dark fruit, cedar, earth, spice & moderate tannins. Pinot Noir, Chile - flower petals, berries & a touch of toasted vanilla. Sangiovese Syrah, Italy - intense blackberry, strawberry, plum & black pepper. Shiraz, Australia - plum, blackberry, currants & a peppery finish. Valpolicella, Italy - soft & smooth with plum & cherry flavours. Zinfandel Shiraz, California - big & bold! Raspberry, cranberry, blackfruit & pepper.